The sixth submission for the GeekTonic Media Gadget Showcase Series is a Home Theater and HTPC setup by Suresh, a GeekTonic reader and HTPC enthusiast. 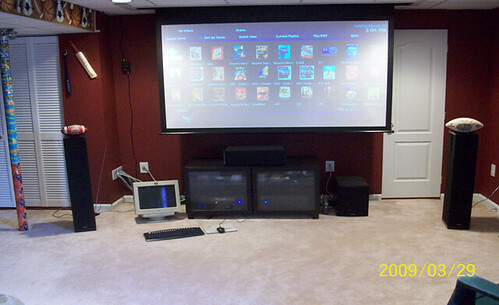 Read on for his great write-up with photos to share all about how he uses his HTPC and Converted an unfinished basement into a very nice, useful Home Theater Room. NOTE: This is a guest post by Suresh. To read more about how to submit your photos and/or write-ups for the GeekTonic Media Gadget Showcase Series, read this. Basic guidelines for writing and submitting a guest post at GeekTonic can be found here. 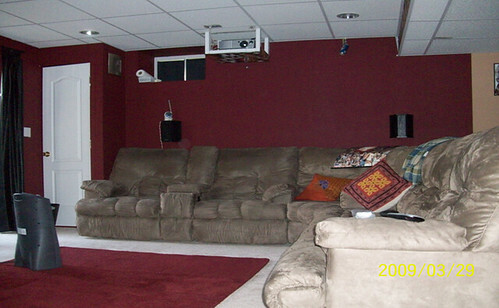 The entertainment area at my home primarily consists of my family room and my basement. 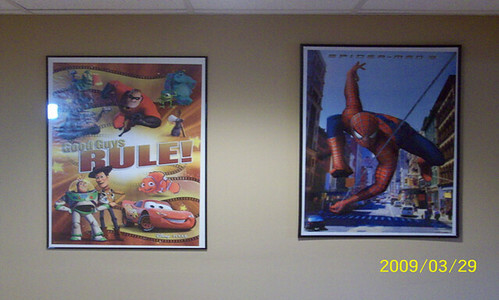 The goal is to have the ability to watch the same programming at both the places with the same kind of interface. I have Verizon DSL for my internet and download needs. I have a Dlink Green 5 port Gigabit Ethernet switch attached to my DSL modem. 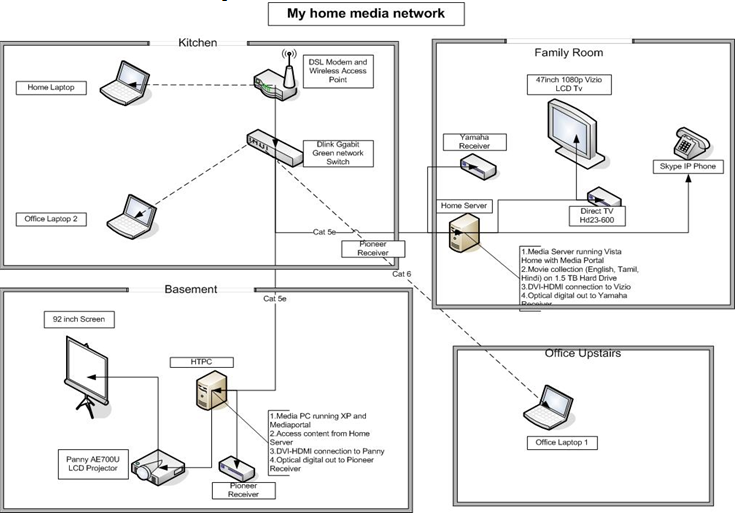 I have cat 5e cable running from the switch to my family room HTPC and also my basement HTPC. I also have Cat 6 cable running to my office room upstairs. I do not have any issues watching SD or HD content that is stored in my main HTPC (family room) throughout my house as it is all wired. I avoid wireless connection when streaming video. 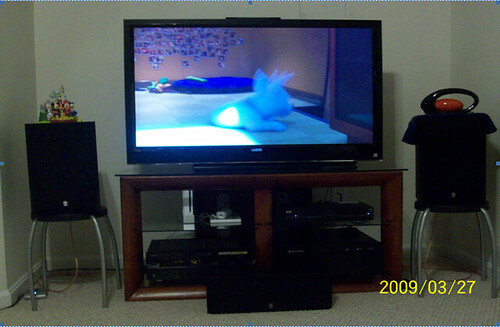 My main HTPC (Intel Based) which is the backbone of my home entertainment. Hauppage 1800 Tuner – with OTA $10 antenna to get OTA HD and also connected via S-video to my Direct TV box. 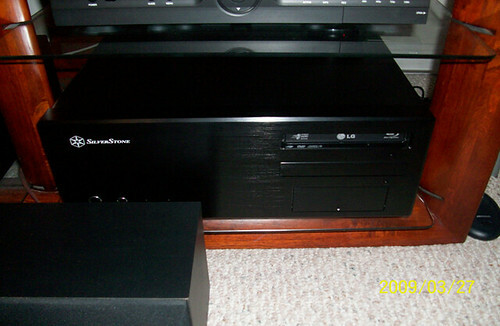 Microsoft IR receiver and the IR transmitter stuck to the front of the Direct TV box. I use both Vista MediaCenter and Mediaportal for my needs. After tinkering around with Mediaportal to get my DVR working and wasting a ton of time, I decided to stick with Vista MCE for my DVR needs as it is so easy. Microsoft has made such a wonderful product… it is just amazing. All you need to do it hookup the cables, put in your zip code, select your provider and viola…. EPG is downloaded automatically and everything is taken care within like 30mts. Nothing to beat Vista MCE in terms of DVR functionality, ease of setup and ease of use. 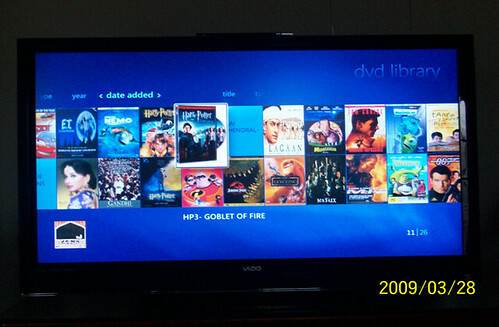 As far as my other media (DVD, movies in AVI, DIVX and XVID) – I primarily use Mediaportal for couple of reasons - the ability to remember a ton of movies at their last watched points and the ability to easily switch between codecs to watch any kind of video. All my DVD’s are direct rips from DVD’s that I own and they are all in VOB format at 100% quality. I still cannot believe that mediaportal is a free software. For people like me who use want to organize their movies, music photos and have a nice interface with customizable screens etc….mediaportal is the way to go. For my bluray needs I use Power DVD 7.3 and the LG bluray drive. I have media browser installed in Vista MCE and it takes care of auto loading the Bluray ISO and firing up PowerDVD. I have a Quit PDVD button programmed in my Harmony which closes Power DVD and restores Vista MCE. We watch all our recorded TV through Vista MCE. I use Mediaportal primarily in my basement. All the movies that I have in my family room HTPC are mapped through network folders in mediaportal and I get the same interface in both places. I also have a copy of PowerDVD running on this machine to watch Bluray movies. I am a big NFL fan and watch all the games in my basement on the big screen. I use the Dish HD box primarily during the NFL season to unscramble the OTA signals. I bought this box in ebay for around 100$ in 2005 and preferred that rather than getting it from dish and giving a 2 year commitment. If there is a need to watch any of the Recorded TV from Vista Mce, I just use windows media player because of all the dvr-ms issues. 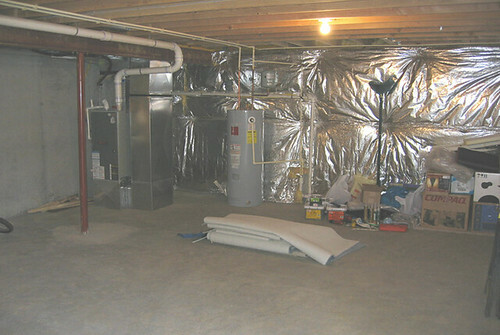 We bought our house in early 2004 and the basement was unfinished. 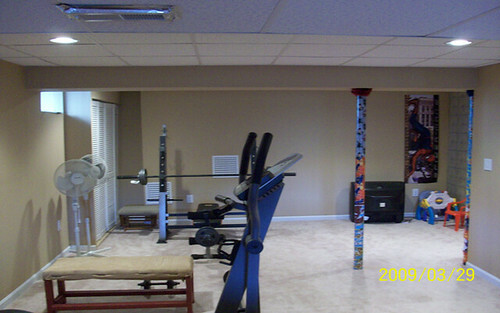 We decided to finish the basement ourselves and started the work in July 2005 and finished it in October 2005. It was me, my wife and a good friend who did most of the work. We got a professional to do the carpet install and the basic electric work. We did the rest of the job ourselves – framing, drywall, dry wall finishing, painting, false ceiling, home theater speaker wiring etc. It was a great experience. The total cost was around 5k for materials and labor (carpet and electric work included) and 5k for the electronics stuff (lamps, projector, Definitive speakers, harmony 880, media stand etc). It was a great investment and we have been enjoying the space for over three years now. The total finished area is around 660sq.ft. 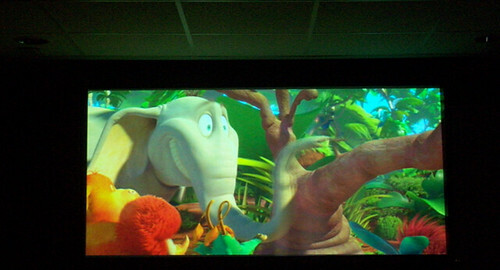 The distance between the screen and projector/seating area is around 18 feet. We added the reclining sofa in March 2007.
for access to storage area. About Suresh: Suresh lives in in the Baltimore area with his wife and son (3.5 years old). He moved to the US from India in 1997 and has been in the Washington DC – Baltimore area ever since. His family loves traveling and has visited most of the States in the US and many countries. As far as our TV/movie watching needs…"we are not that much in to TV. We watch stuff like dateline, 20/20 and a lot of travel channel and HGTV. 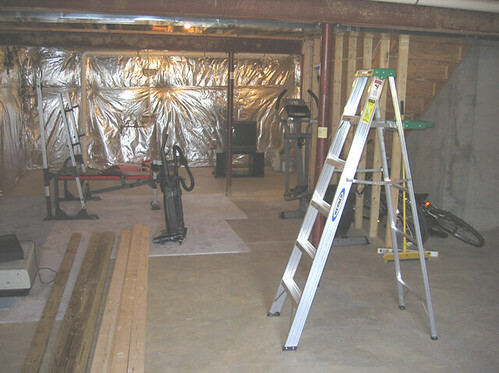 That is how we got hooked into finishing our own basement (more on that in the following pages). I decided to build a HTPC in late 2007 and started reading avsforums, TGB etc. I have been hooked on to these sites and blogs like GeekTonic and digital lifestyle ever since." 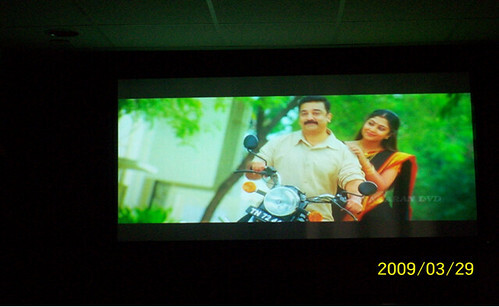 Thanks to Suresh for sharing his media setup. 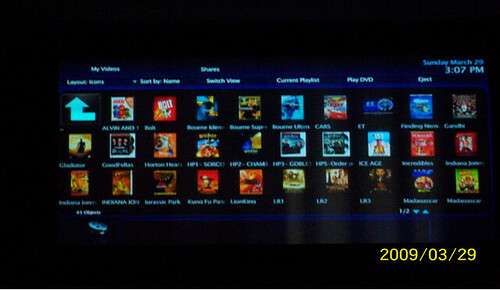 Read more about Suresh's HTPC and Home Theater on his blog.